Hello! My name is Jennifer Smith Jochen from Smith Curriculum and Consulting, and I am ECSTATIC to be here at Minds in Bloom with you today! I have been using interactive notebooks in some way, shape, or form for the past eight years and “officially” the correct way since fall of 2010. I have seen so many benefits with the usage of them over the past years, as well as grown and developed as a teacher to better help my students. Currently, I travel around and present not only about the benefits but also about how to implement them while sparking ideas in teachers to help them along their way. 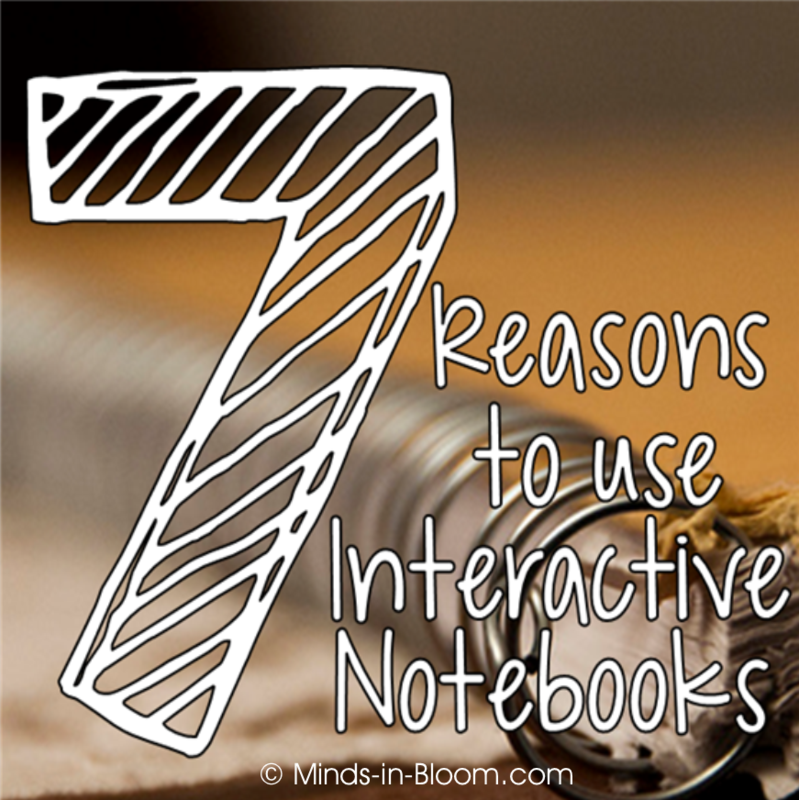 So what is it about interactive notebooks that make them such a hot commodity in education? Why are they such a beneficial tool for students and teachers? What can classrooms and parents gain from their usage? 1. Interactive notebooks teach students to organize and synthesize their thoughts. By working with students to create a process for them to organize their thinking, you will be able to teach study skills without “teaching” them. Processes build structure, and with use of left- and right-side pages, students will naturally organize their thoughts. 2. Interactive notebooks accommodate multiple learning styles at one time in (and out of) the classroom. Whether you do teacher input activities as a whole group or as a small group, student output activities give students the ability to show exactly where they are in their understanding of the subject. 3. Student-teacher-parent interaction is built and strengthened with the use of interactive notebooks. When students are working on homework at home with their interactive notebooks, not only will students be able to use them, but parents will also be able to have a resource into the learning that is taking place in the classroom. 4. Students are building a portfolio that allows for teachers to track growth over time. Reflections of what students are learning in their output pages (as well as the work shown) will show how they are synthesizing the information learned in class, and as students develop further skills, this will be reflected in their output. These reflections are great to show during parent-teacher conferences and even discuss during student-teacher conferences. 5. Interactive notebooks have students create a resource to use as they continue to extend their learning. 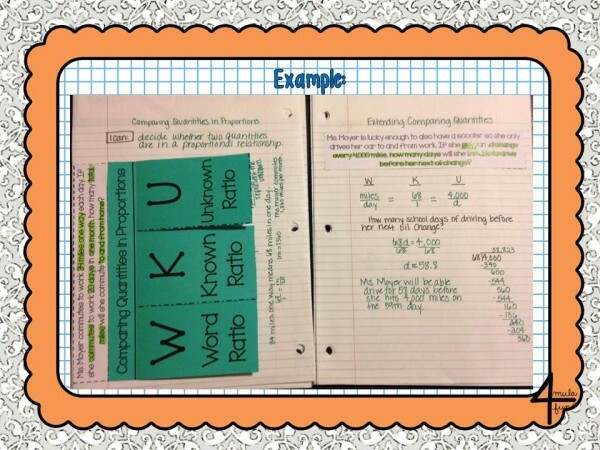 An interactive notebook works as a textbook for students that is theirs. Not only are they taking beneficial notes, practicing, and reflecting on material, but they are also using that information as they work on future activities. Students are going back and reviewing the prior pages repeatedly and therefore building exposure to the material each time. 6. Students take ownership of their learning through color and creativity. One of the main things that helps students to buy in to the use of interactive notebooks is not the benefits they can see from it but the ability for it to be their own. When students know, and are allowed, to use color in their notebooks, it makes their notes come alive. Using colored paper, markers, colored pencils, etc. makes it easier to sort information and group things together. This creativity also sparks the visual learning when they are expected to remember and apply the information at a later date. 7. Interactive notebooks reduce clutter in the classroom, as well as in students’ lives. By having students take all of their notes and then also practice and reflect in one location, it allows for them to be organized. Therefore, it eliminates excess papers being lost and misplaced when students would benefit from using them as they learn. 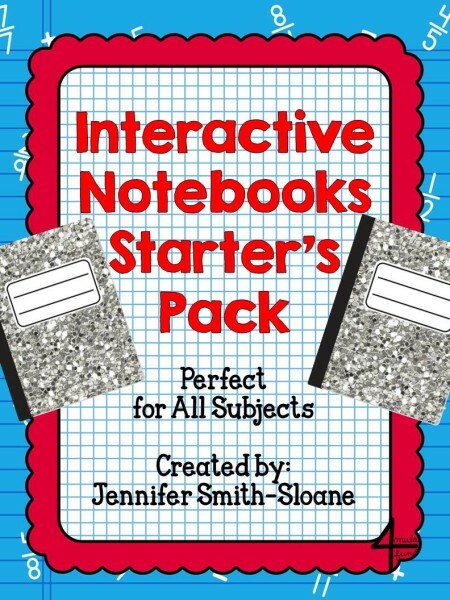 Are you looking into starting interactive notebooks in your classroom? I’ve compiled several of my resources into an Interactive Notebooks Starter Pack to help you get started or even to enhance what you are already doing in your classroom. Just click on the image below to grab your copy. I have been an educator since 2004 with experience in elementary school, middle school, and college. Math has been my passion since a young age, which no doubt resulted in my secondary math-teaching career. Currently, I am a Differentiated Curriculum Designer and Consultant traveling the nation to train teachers on the effectiveness of interactive notebooks and differentiation in the math classroom. When I am not traveling and training, I live in Fort Worth, TX with my husband, Billy, and our three dachshunds. I spend time blogging at Smith Curriculum and Consulting and creating resources for my TpT store. Oh, Jennifer I think you've just convinced me to get off the fence! I've been "sort of" using interactive notebooks but definitely not "officially" or in the correct way! I love that students can use them as a resource to refer back to and the organization and portfolio of learning aspect of them are an added bonus! LOVE this post! I started seriously using Interactive Notebooks during Math this year and my scores have soared! There was one day where we took regular notes and my kids were NOT engaged at all. That really showed me the value of the interactive notes we were doing. My only regret is that I didn't take enough pictures of my students putting their together every day – it would have been a great blog post! This is where you put incoming information: notes, data, and so on. Print them out and tape them in. While I know that many research studies state the opposite for Input/Output placement I have been working this way because it is what my brain understands. I have seen success doing it this way with my students as well. I am a proponent of "Your Notebook May Vary" and tell teachers all the time to do what works for them and their students. Thank you so much for sharing. Question: How do you deal with the situation of having a student who constantly leaves his or her notebook at home? I have had students leave them home but not constantly. It usually happens once or twice. In those cases, they do the work/notes on separate paper and tape them on to the pages where they belong. That way, everyone still stays on the same page. I also have never had a student completely lose a spiral. I usually have extra spirals and get them caught up as best I can (they usually come in before school or during a study hall to photocopy what is missing). Nine times out of 10, we find the spiral within two days! My biggest issue is that the covers sometimes rip off. Students have kept their spirals in a gallon bag, and this year, I switched to a harder-backed spiral made from recycled products. I am interested in using the interactive notebook for my cosmetology class. I would like some ideals. As a parent of a special education student, I personally loathe the INB. My son struggles w/this “INB” it’s a disaster. everything is out of order, he loses worksheets because they get torn (because even when they get glued in they stick out or only partially glued in) or not glued in properly. I often have to try and organize it for him which is difficult when I dont know what goes where. What I wouldnt do to have a textbook at least as a backup. An INB does not help my son who has severe adhd w/a math disability to stay organized at all. It just emphasizes and expresses how his brain works. It’s his chaotic unorganized distracted frustrated brain all in a 3d miracle INB. It’s just one more thing for him to worry about. This idea assumes that anyone can do it, and it’s just not the case for us. I know because this is the second year we have been dealing w/this INB. At least w/a binder he could just put them in the binder w/o worrying about glueing something in, and if those get lost at least he would have a textbook to fall back on. I also have adhd, and he brings these apparently “miracle inb” and I just feel so helpless because it is not helpful. It hurts my brain just to look at it, I know his view is not much different. I want to throw it across the room, set it on fire and throw it in the trash. I dont see why INB and textbooks cant work in unison. You can tell me how great it is, but for us it just isnt. I miss the textbook at least it was legible and organized, everything my son’s INB is not. He even has an SE teacher to help keep it organized and it’s still not enough and this takes time away from doing other things like working on classwork that he is behind on. Can you tell me what Im missing? Sorry that I am just now replying to your comment but I haven’t looked at comments on this post in quite some time as I’m not notified of them being here. When I had students who struggled with this I tended to do more for them before they received their information to put it in their notebook. They also scheduled a weekly tutoring session with me to make sure we were up to date on everything in their notebook. Another step that I did with some students is they would only have one unit at a time in a pronged folder so that was their interactive notebook. Having too much in one location was overwhelming and this allowed for them to focus on the one unit. Awwww man! I missed the freebie! Interactive notebooks are used as a great tool to teach students how to be organized and reduce clutter. They also help build a parent/teacher interaction The teacher will be able to track information about the growth of the students and at the same time the students will be able to use his/her interactive notebook as a resource. Interactive notebooks are used to organize and synthetize their thoughts. they are also used to establish parent/teacher interaction and a resource for the student. Most of all , the teacher will be able to track the student growth over time and reduce clutter. Great way to track students ‘ progress and to reduce clutter. I would use it for both science and math. I’m with Amber. INB are the bane of my ADHD child’s life. Unless the teacher is there to help on an almost daily basis, INB are harming my child’s development and performance. So far, not one teacher has been willing to help him. They get frustrated and say, “Why can’t he follow along? I told him what to do!” No, my delayed-development, executive dis-functioning, can’t-follow-3-step instructions child can not follow along!! He simply can not track, organize and multi-task all the parts that go into an INB. He can learn the curriculum and academically out perform 90% of his classmates if allowed to demonstrate his understanding with traditional assessments. But he is not a book editor or a scrapbooker. Jennifer, what is your special education background? Teachers, what is your plan to assist special needs students through the implementation of INB? If you do not have a specific plan that includes ALL the students in your classroom, then you should NOT USE INB!! Thank you for your comment. Actually I am Sprcial Education certified and have been since 2011. My Resource Math students as well as the students in my regular classes with accommodations flourished with Interactive Notebooks each year. A students notebook is their own source of notes and a teacher lays the foundation through teaching for what is to go in them. Does your son require extra time? Fine, make sure a copy is provided so he can catch up. Or have him go in for tutoring regularly to make sure the gaps are filled. Does he need alternative ways to complete the work? Make sure the teacher is providing those based on the accommodations required on his IEP. Each lesson with an INB is just as different as each teacher. My lessons were never overly complicated for a student to cut/glue and in fact they only had two directions- 1. Cut on the dash 2. Fold on the bold. I hope this helps and that you take the time review your child’s needs with the teacher(s) do that you can see how beneficial INBs are to develop students understanding, study skills, and so much more.